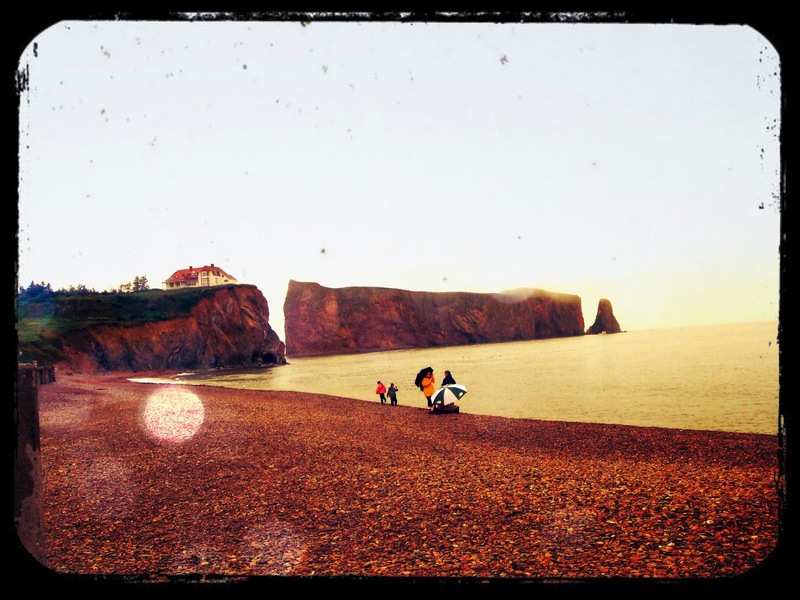 A black cat around the world: Percé rocks!! Percé is a small village overlooking the Gulf of St. Lawrence, in the region of Gaspesie, Quebec. St. Lawrence feels like the sea, but it is not : I was about to describe Percé as a "seaside resort", because this is actually the kind of impression one gets at first, with the mirror of water looking infinite in front of you, the seagulls fishing for crabs, and lobsters as the main local specialty; but the St. Lawrence is actually a river. Percé is a pretty little place, a holiday place that has a bit of old England taste (despite being in the French-speaking part of Canada), with colorful wooden houses, a creaky bridge that takes you along the shore, a few souvenir shop with a sort of modern kitsch taste, and some friendly small restaurants specialized in poutine . The poutine, for the record, is a brave traditional dish of Quebec, made of french fries covered with plenty of cheese and meat sauce. The definition of "brave" is given only from the point of view of my stomach, which, unfortunately for me, bears a delicate constitution, and already knows that, venturing into this kind of super-protein adventures, could risk to find itself with not enough forces to go through the whole digestive tract. 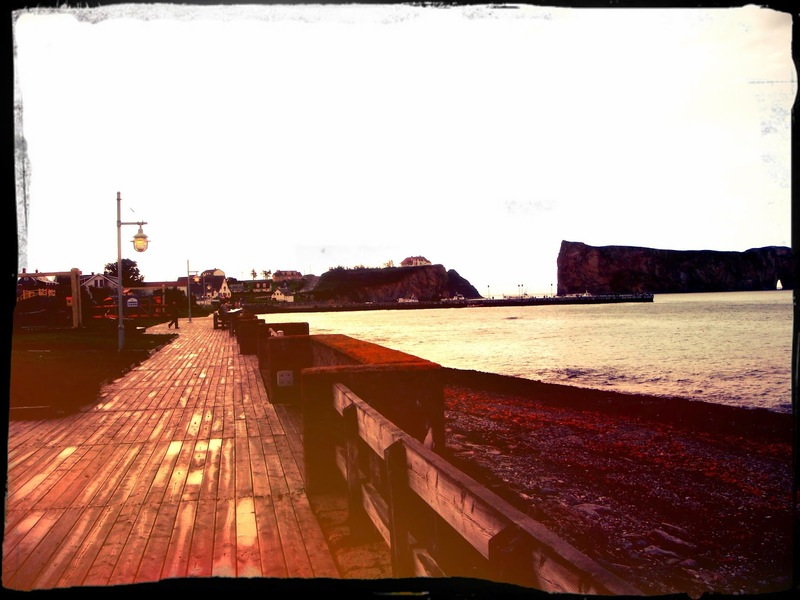 In any case, even if the taste of poutine for me remains unknown, of Percé I keep a good memory, almost softened, mixed with the flavor of their ice cream dipped upside down in the liquid chocolate and the smell of damp wood that dominates the walk along the shore - even in the benches with their backs carved in the shape of seals, and in the garbage cans having the form of gannets. 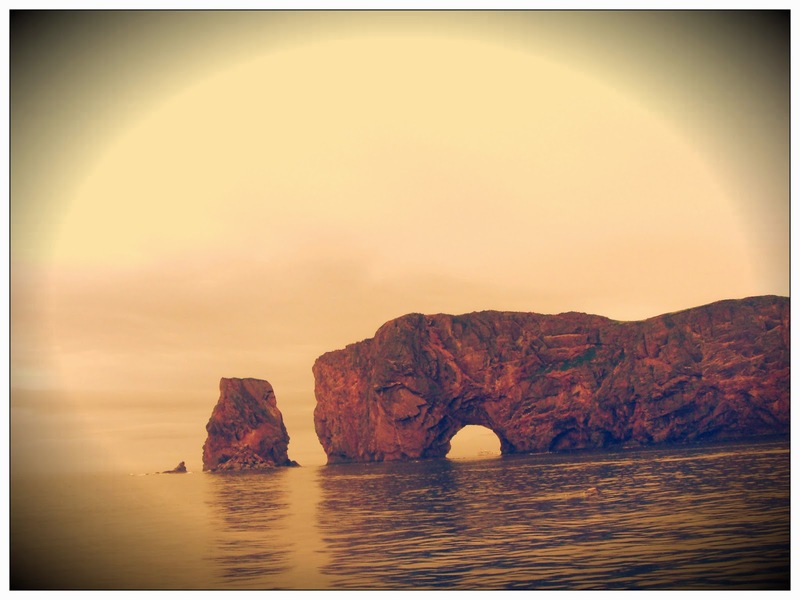 But what makes Percé famous, or better, what in fact gives it its name, is the Rocher Percé , a large conglomerate rock that stands in the water, not far from the shore, and which, with its imposing silhouette dominates the skyline of the town. The name literally means Pierced Rock , and in fact is what it is: it is a kind of an arch, but the opening is small and decentralized respect to its large size, so it looks rather like a huge rock that has been pierced from side to side, a giant with a cannonball hole in his stomach. It seems that at the beginning it was joined to the mainland, but then the piece of conjunction collapsed, leaving only what you can see today. 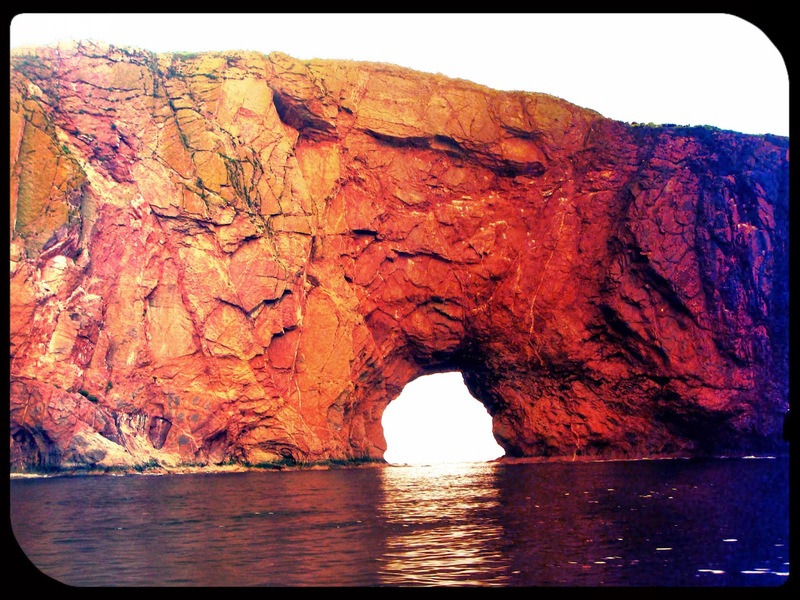 Percé is quite elevated, slipping gently into the gulf, so the Rocher is visible from almost anywhere in the town. A local way of saying defines it as a kind of monster, a Cyclops with his only eye always open, that changes color depending on the mood of the sea, becoming green, blue, gray or dark. It is as a sort of guardian made of stone, maybe a bit grumpy and frowning, but in its own way solid and reassuring. 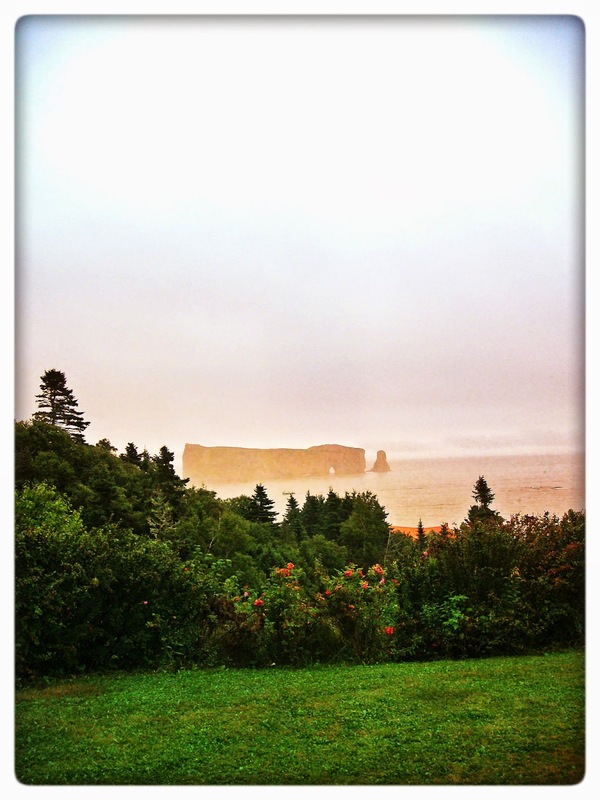 During our three-day stay in Percé, I have been able to see his eyes change color several times, and also to see him wear different clothes - a veil of mist, a golden cloak made with the sun shining against a still dark sky, and even a more frivolous and unusual accessory like a rainbow. 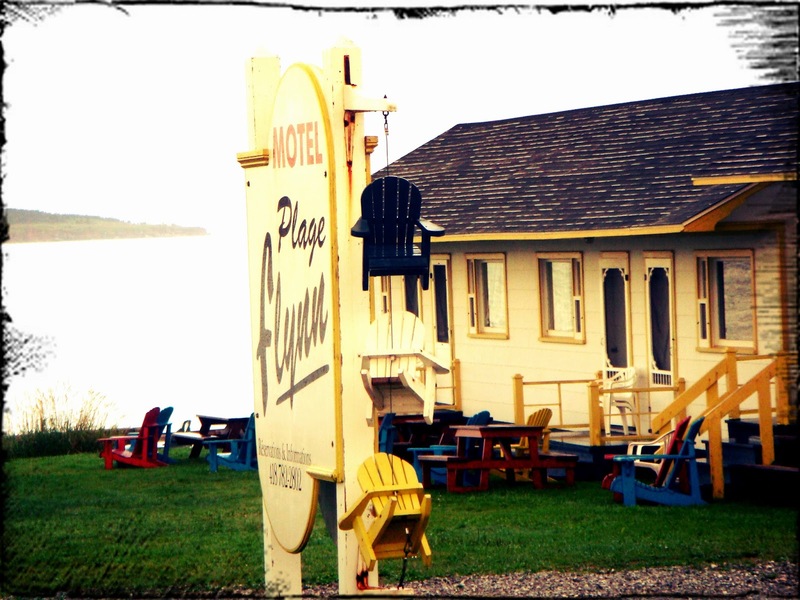 Being able to see it from the door of our motel located on the headland, every morning when waking up and every evening before falling asleep, had become an almost familiar habit, even if lasted only for a short time. The Rocher is connected to the legend of a kind of French Romeo & Juliet - young, in love and a bit mélo, who, in front of the impossibility of being able to live their love, preferred to sacrifice himself. He was an army officer, in the period when the French were fighting the possession of the Canadian territory with England - sent to fight on the banks of the St. Lawrence, his main regret was having to leave his beloved promised bride to sigh alone in the Old Continent. But our Blanche was a strong and determined girl, with an hint of modern spirit, and she had already understood that, often, if women don't have some little initiative, it might be hard to get some kind of breakthrough. So she decides to leave the Old France and to sail towards the New one and her beloved. Alas, the journey is long and perilous, and when she had almost reached her destination, her ship gets attacked by a Spanish pirate, who were hanging around the gulf as well trying not to leave the Canadian pie only in yhe hands of England and France. As soon as the captain of the pirates Blanche falls desperately in love with her, as obviously enough our friend is also a dazzling beauty, and being a pirate-gentleman, he decides to marry her. Blanche refuses, being in love with her ​​beau official, but the pirate democratically tells her that she has no alternative. Therefore she agrees, but on the wedding day, rather than betray her beloved one, she prefers to jump overboard and let herself drown. The Pirate-gentleman desperately tries to save her; but then all of a sudden a thick fog surrounds the pirate ship and the crew finds itself in front of a giant rock, against which they miracously avoid to get wrecked. Such rock was obviously the Rocher, but according to the crew it was actually the ghost of poor Blanche outstretched in the act of cursing. In any case, our French Juliet and the Rocher are deeply linked, and it seems that her restless soul still hovers around there when the fog rises. Who knows where she goes when it's sunny? I have no clue, since I have not seen her even with the mist: the only hovering creatures that I saw around there were the gannets. I've been selling trips to Percé for years now but have never been. 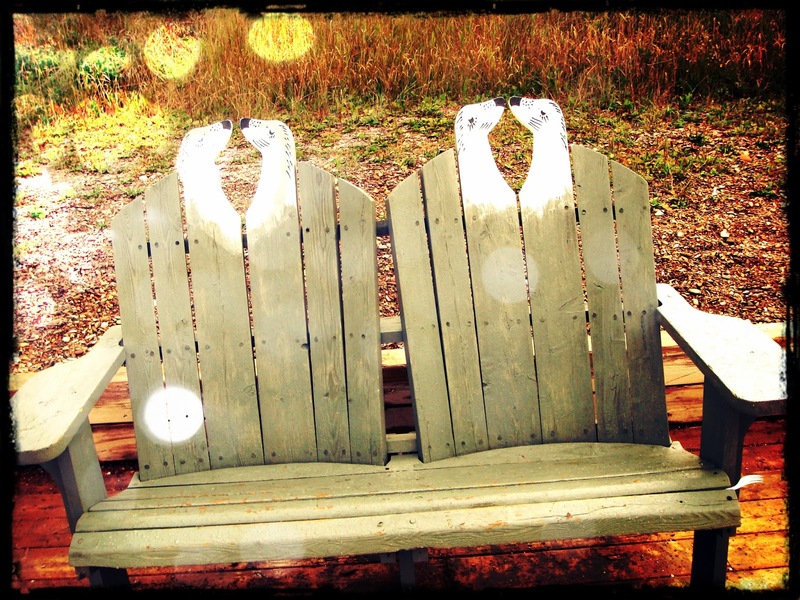 But now I can make selling easier with your story, thanks for sharing it! 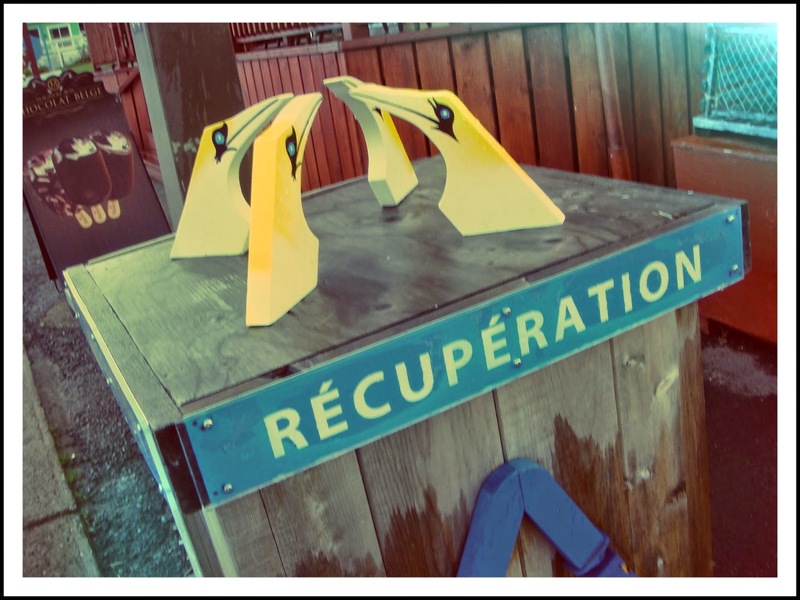 Liebster Award - 10 questions to me & 10 to you!